the extensive mediation concerning safety recommendations following the death of a sailor. A general introduction surveys the most important and peculiar issues pertaining to the event. 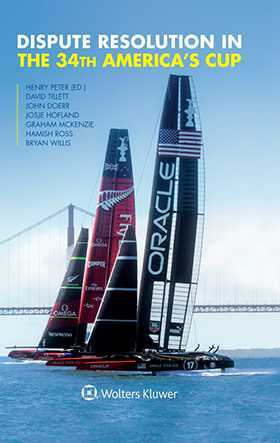 Written not only as a comprehensive legal record of the 34th America’s Cup but also with a view to favor future matches and to limit the possibilities of new controversies, the book takes a signif-icant step toward ensuring that disputes are dealt with by arbitration and not by lengthy, costly, and uncertain state court proceedings. In this way the book provides invaluable guidance for trustees, competitors, and event officials, not only for the America’s Cup but by extension to other major international sporting events. 2. THE DEED OF GIFT (24 OCTOBER 1887). 3. THE PROTOCOL GOVERNING THE 34TH AMERICA’S CUP, INCORPORATING AMENDMENTS 1 THROUGH 19 (CONSOLIDATED VERSION 2 SEPTEMBER 2013). 5. OTHER 34TH AMERICA'S CUP GOVERNING DOCUMENTS. 6. THE 34TH AMERICA'S CUP JURY DECISIONS.